Writing alternate histories is a perilous enterprise. We ask of the writer to provide us not merely with a plausible world, but also a plausible account of the workings of history. There is, of course, a certain kind of safety in distance: alternate histories of how the Confederate Army won the Civil War, or how the Nazis triumphed in World War II (two of the most popular themes in the subgenre), deal with events that have achieved a degree of historical closure (to whatever extent that is ever possible), and whose politics no longer hang quite as heavily as they once did. It is much more difficult when the event continues to reverberate, when its protagonists are still alive, and when its meaning is still contested. There is a risk there, that at any time the politics will bleed into the fiction, overwhelming it and transforming it into a polemic or an apologia. And it is this long shadow of present politics that Nick Wood's debut novel, Azanian Bridges—an alternate history of early-twenty-first-century South Africa, where apartheid never ended—must contend with and overcome. Azanian Briges is the story of an apartheid South Africa, sometime around the year 2010. Two white psychologists invent an "empathy enhancer"—a machine that allows the transmission and amplification of brain waves in a way that the operator of the machine can tap into the subject's "experiences" without the mediation of language. Soon, the secret is out, and a desperate struggle begins for control of the machine: between the African National Congress, that sees it as a potential tool of liberation, and the apartheid regime, that sees it as a risk, or a weapon—or both. The struggle is conducted in the townships and ghettoes of South Africa, in the capital of Zambia (where the black protagonists travel to politically liaise with an increasingly influential China), and finally, in the torture chambers of the regime. The very name of the book is laden with political symbolism. "Azania" was an alternative name for South Africa, proposed by certain liberation groups during apartheid (the only time the word features in the book is during an incident with the "Azanian Peoples' Organisation", a group that still exists in South Africa). And the metaphor of the "bridge" has been central to the South African political imagination. The interim Constitution of 1993 called itself a "bridge" between the past and the future, an image that occurs and recurs in significant decisions of the constitutional court. In its very title, therefore, Azanian Bridges suggests that it will not shy away from political engagement. But with such a heavy-duty name, and in a world where there seems to be little that separates Marikana from Sharpeville, the risk—mentioned above—of a story becoming merely a vehicle for a political message is even sharper than usual. And that risk seems further heightened when we find, after the first two chapters, that the story will be told alternately by a liberal white Afrikaner (Martin van Devanter), and a black college student (Sibusio Mchunu). Despite the surface abundance of tropes, however, Wood manages to steer clear of making Azanian Bridges only a polemic or an allegory. For a start, we are told very little about how the world got here. Through snippets of information, dropped casually into our laps, and spread out artfully across the novel, we can reconstruct the history: the Berlin Wall never fell, the Soviet Union continued to exist and fight its wars in Afghanistan, and (presumably) the fear of communism drove "Bush and Blair" (p. 86) to continue to prop up the apartheid regime. Mandela remains on Robben Island, while Thabo Mbeki and Jacob Zuma remain in exile. However, as Obama, and his mujahideen ally, Osama bin Laden, meet the Soviet bloc for peace talks, and as China expands its influence in the continent, cracks in apartheid's armour are beginning to appear. And that's about it by way of information; although it might feel unsatisfactory at times, so momentously different a world built on such paper-thin foundations, it works because it manages to keep international politics from overwhelming an already politically-overdetermined story. Secondly, Wood's characterization is excellent. While his protagonists are clearly representative in a certain sense, they are not reductive. Martin van Devanter, for instance, is familiar enough as a decent individual benefiting from racial privilege in an apartheid society. "I'm a liberal Afrikaner, non-racialist in my attitude" (p. 60) he says early on, and soon after that, "psychology is politically impartial in South Africa." (p. 62) But he is also human, all too human, haunted by a failed marriage and hamstrung by an absence of conviction. Martin, in fact, resembles some of the protagonists of Margaret Atwood's SF novels: passive, not at all given to heroics, more the Attendant Lord than Prince Hamlet, and caught up and buffeted by the tide of events, rather than exerting any form of control. Once again, in the heavily overdetermined political background of the novel, a disengaged protagonist—apart from being easy to identify with and relate to—preserves the sense of story. The Empathy Enhancer seemingly dispenses with the need to shift words, or for a "return to words" (p. 73). Here, the image of the bridge returns: Martin calls the machine his "Bridge of feelings" (p. 61). In a world where the philosopher Karl Jasper's rueful remark in a letter to Martin Heidegger—"all language seems to be only a bridge to me"—seems more and more out of place, perhaps the only bridges that we can build must do without language. And yet, there is a lingering sense—fortified by the book's ending—that this is too optimistic a view. In contrast to Jaspers' optimism, Nietzsche once described language as a "rainbow bridge," signifying its illusory character. The reactions of apartheid officials to the Empathy Enhancer—towards the climax of the novel—suggests that getting rid of language altogether is an illusory solution. After all, as Herbert Marcuse perceptively wrote, it is society that imposes a medium of perception—and Azanian Bridges seems to suggest that direct access to another's experiences might not, in the end, dispel that medium of perception. And so, what might therefore seem, at its surface, to be a story about technological utopianism, winds up as being far more ambivalent about the limits of technology (there might also be a gentle rebuke here: technological utopianism has, of course, been a staple feature of SF for a long time). I will end with a small quibble. There are moments, while reading Azanian Bridges, when one feels that the 1980s have been simply transposed upon 2010. There are the same liberation slogans ("amandla," "one settle, one bullet"), the same political parties and armed fronts (the Umkhonto ve Sizwe plays an important role), the same real-life political figures. If apartheid did survive for twenty-five years after 1985, wouldn't the vocabularies of resistance evolve accordingly? And wouldn't the underground resistance movement at least encrypt their phones to avoid detection? This remains, however, a minor point. 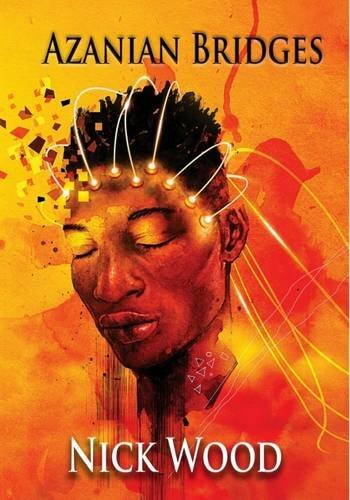 For the most part, Azanian Bridges successfully avoids the minefields of the genre, refuses the temptation of an easy ending, and succeeds splendidly in telling a powerful story about language, power, technology, and the illusion of the "rainbow bridge." Gautam Bhatia is based in New Delhi, India. When not at his day job as a lawyer and legal academic, he tries to lay hands on the latest works of historical and speculative fiction—with a particular taste for high fantasy and Orwellian dystopias—and read them from cover to cover. He has reviewed before for the Jadaliyya Magazine , and blogs about books at anenduringromantic.